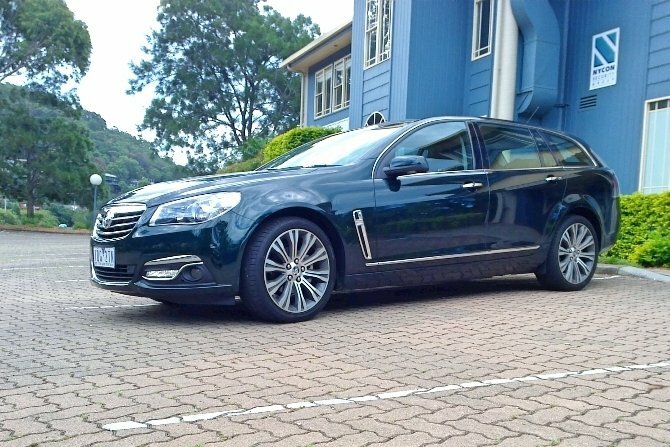 THE folks at Holden handed us the keys to a couple of their cars over the last few weeks, and the first of these, it has to be said, represents a great piece of motoring kit – it’s sporty, roomy, has plenty of grunt, and it drives like a well tuned sedan – except it’s a sports wagon. 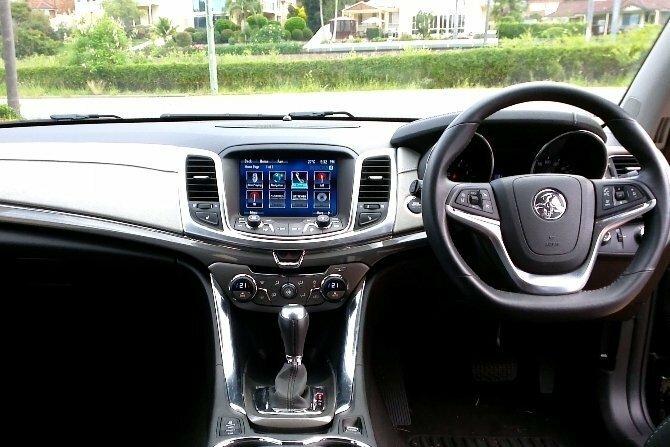 We managed to get our hands on the 2015 Holden Calais VF V Sports Wagon, fitted with a six speed automatic, and powered by a 3.6L V6 DOHC VVT engine, that puts out 210kW power and 350Nm of torque in a tidy package that was surprisingly good in all conditions. 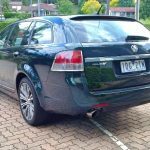 Surprising because the engine and gearbox are both carried over from the previous VE model, although Holden engineers have not only tweaked both, but have also worked hard on quietening the whole driving experience. Somewhere along the way they sacrificed the heavy duty sports suspension as well, but we were still impressed by the body roll and overall driving feel of the Calais V and from the street it’s certainly a nice car to look at as well. Inside you will find comfort in the full leather interior, with multiple adjustment options and a flat bottom steering wheel that features a the usual gamut of electronic controls you would expect from a car at the pointy end of the luxury optioned model range. The features list is pretty decent too, with dual-zone climate control, reversing camera, parking sensors, self-parking, blind spot and rear collision traffic alert, rain sensing wipers, 8-way power front seats with heating, 19-inch alloy wheels, lane departure warning, forward collision alert, head-up display, and satellite navigation. 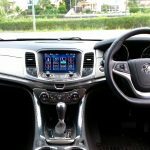 The MyLink infotainment system is fully optioned, and safety is at the forefront of Holden’s thinking with six airbags and all of the electronic aids listed above, as well as a very good traction control system. 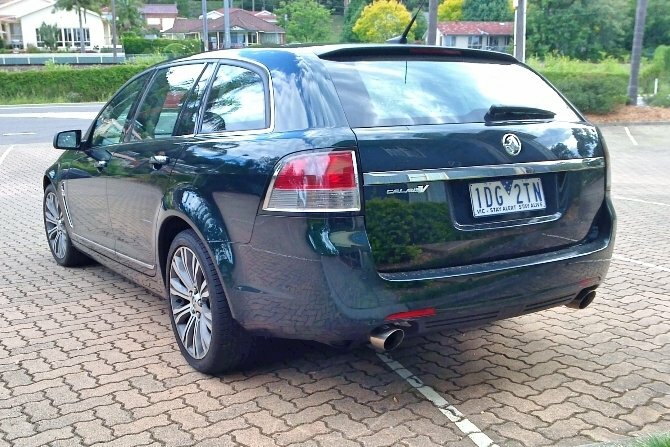 Are there drawbacks to a car that represents the swan song for the current version of the Commodore and Calais name plate? Sure. 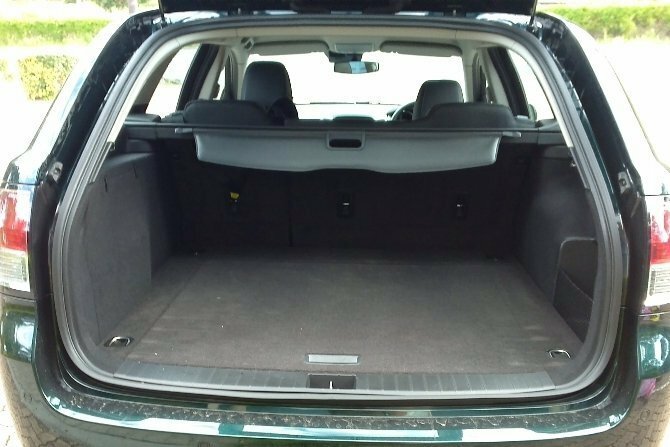 For example it’s thirsty, old school thirsty, at more than 9L per 100km; and the boot space while large in depth is simply not wide enough to fit a stroller across ways. 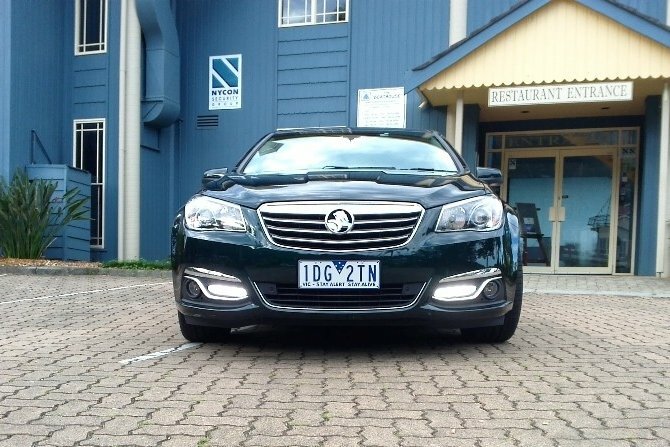 As for colours, well there’s now lots of choice, although most are premium and cost around $550 extra, save for the basic Heron White, and include Regal Peacock (darker than dark green – our test vehicle was this colour), Phantom, Prussian Steel, Alchemy, Nitrate, and the super cool Some Like It Hot Red. 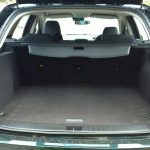 Priced from $49,990 plus on-roads (it should be noted that the best drive away price we could find was $54,000 for the V6), carrying a good power to weight ratio, and seriously family friendly, the 2015 Holden Calais VF V Sports Wagon is definitely worth a look. 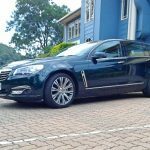 Our test vehicle was provided by Holden Australia. To find out more about the 2015 Holden Calais VF V Sports Wagon, contact your Holden dealer. Pros – looks fantastic; game changer; feature packed. Cons – rear handling; torque levels in low gear; some of the interior components feel plastic. A good all round car. The holden vf series 2 dark what can i say ……Wow …. what happened to the v8. Its more power than before pulling 5 sec to100km set your seat warmer weather conditions who cares. I’m i feel like there enless power of contol here its quick. Turn it back a knoch we can drive your daughter to her ball rolling on next to 1500revs 6 gears bose speakers touch screen leather all round.it turns heads every one looks when you open upin first gear. With 3 modes you can experience the stile the torque or the spring like sports manual effect you can also spend more money and go for the faster supper sports R8. But realy are you looking to race your car or drive knowing its a great car. Cant agree more that ccarries a lot of history and yes its a wonder if you buy it now why would you. But if you drive it you will love it dont juge to you try for yourself.